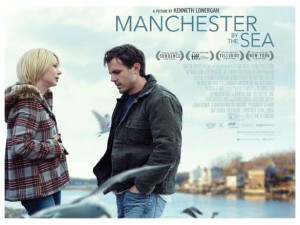 A very powerful and emotional film about a tragic life and the characters living it. o. A very powerful movie, this one is compelling and fascinating in all the right ways with Casey Affleck playing a guy who you constantly want to know more about. The movie is about his character, Lee Chandler, learning that he is sole guardian to his brother’s son, but it is really about so much more. It’s about this man who is broken and how he got to be that way. It’s about how Chandler is now, and the baggage that he’s dealing with and holding onto. And it’s told in such a way that it interchanges flash backs with the present day story to give us the full picture in a way that fully hold our attention. Manchester By The Sea is a smart and powerful movie. It’s a film that tries to do a lot, and for the most part, it succeeds. 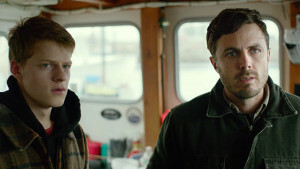 The movie tells a story in the present day, about a man named Lee Chandler, (Casey Affleck,) who finds out his brother passed away, and that he has been named the guardian to his brother’s son, Pattick (Lucas Hedges.) But the movie also tells multiple stories through flashback, about a former life these characters had and how it led to their present day situation and state of mind. With all of these storylines, and how one leads to another, the movie works nicely. One might look at this type of performance and think, Affleck is just playing himself here. After all, the actor does have the same laid-back kind of personality as this character, meaning that of a man who has been through a lot, is laid back about how much emotion he will show, and yet internally is very opinionated about life. Now all these statements about how similar Affleck the actor is to Chandler the character, may be true, but the fact remains, what the actor gives us here is terrific, no matter what the circumstances are that led to it. This is an incredible story told in a heartbreaking and dramatic way, and Affleck is the actor we want to follow and keep following the whole way through. That story, which is so brilliant, really works because of how many layers and paths it’s running on, and the way each one of them continues to unfold. The movie starts with us watching Affleck do the jobs of a super around an apartment building. This means taking out trash, changing light bulbs, and little things like that. But then it gets ratcheted up a little, branching out into comedy. There’s a scene of him unclogging a toilet for a neighbor who he overhears on the phone, saying he’s hot. And then another woman who accuses him of wanting to watch her in the shower. She’s rude to Chandler and he gives it right back to her, leading us to a scene of Chandler sitting down with his boss in an office, refusing to apologize. Instead, Chandler explains to the boss exactly what his importance and contribution is to working there. He does this in a fast talking, powerful, and convincing manner that kind of leaves your jaw on the floor. And all of this is to establish his character. He’s smart, tough, and not willing to compromise for anyone. While that might sound like Mr. Cool, coasting through life, the truth is that Chandler is is a guy who is absolutely miserable. He spends his days doing these terrible jobs, and his nights out drinking at a bar by himself, refusing to talk to anyone, but jumping at the opportunity to get in a fight. When a woman spills a drink on him and then tries to flirt, Chandler turns his back on her. When two other guys stare at him, Chandler walks over and beats them up. There are some reasons behind all this (reasons why he would want to be alone, and refuses to date or look for happiness,) but we won’t find out what they are until later on. Flashbacks show us Chandler and his brother, Joe (Kyle Chandler,) out on a boat with Joe’s son. They show us Joe getting the news of his sickness from a doctor in the hospital, and learning how short of a time he has left to live. And they show us the wife, children, and lifestyle Chandler used to have. The women are some of the most intriguing characters in the film. There’s Michelle Williams, playing Randi, Chandlers ex-wife, and there’s Grethchen Mol as Joe’s wife. Both seem to have issues that the movie only hints at, feeding our curiosity and desire to find out more. And while all of that is given to us through flashback, we get the present day story of Chandler getting the news and driving up to Manchedter to be there for his nephew. He wants to be the one to tell his nephew and rushes to get to Manchester before the boy’s school and hockey practice let’s out. Chandler ends up going home with his nephew, Patrick (Lucas Hedges,) and living in the house, acting as the temporary guardian. He’s a fish out of water in this kind of situation, and watching him figure it out is a lot of fun. And little by little, that’s exactly what he does. He asks Patrick what Joe would have done and allowed, and pretty much plays by those rules. And Patrick has a hell of a social life that Chandler gets involved in, despite his best efforts not to. Patrick is dating two different girls at once, plays on the hockey team, and is in a band. One of the funniest and most awkward scenes comes when Patrick asks Chandler to basically watch over a girls mom to keep the mom out of the way while Patrick and the girl get it on. Now, remember, Chandler is the kind of guy who won’t budge for anyone. He makes the effort by going to this, but that’s about as much as he will do. The results of the sit-down between Chandler and the girl’s mother are pretty humorous. There’s a big secret that comes out, about halfway through the movie, and it really changes everything. I love the way this movie doesn’t leave that secret and its revealing for a twist at the ending. Instead, it comes out when it feels right, and it suddenly explains a whole lot about how these characters ended up here. While that plot point works wonderfully (and definitely helps to explain why Chandler would want to be alone,) it also ends up hurting the movie a little by not leaving anything for the end. While I liked the placement of this surprise, in the middle of the movie, the ending to this one needed to be better. It’s really the only flaw to the film, but it’s certainly a big one. 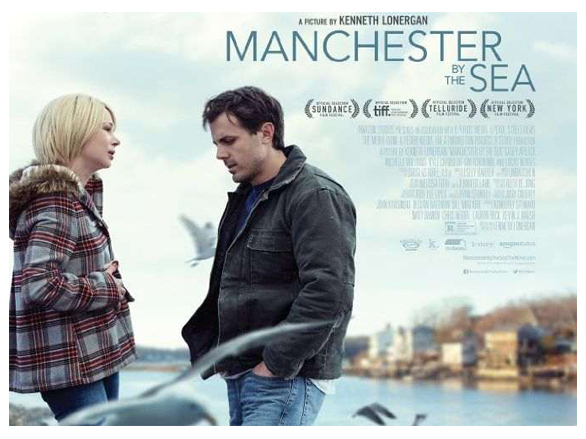 Manchester By The Sea is an excellent movie. Everyone in it is fantastic, and in the case of many of the actors, it’s a just a shame that we didn’t get to see them more. Michele Williams, in particular, is a standout performer, and here she is given such a small and limited role. She definitely makes the most of it. The movie is captivating and clever in the way it tells different storylines in both a past and present format. The present plot, about Chandler adopting a boy, is good, but it’s the flashbacks that really hold our attention, as we try to find out what happened to the women, and how things got to the way they are. The movie is packed with emotion, and works on most levels. One area, however, where it does fall a little short is with its ending. While the movie might give us the most realistic ending, (just like La La Land) did, there seems to be something missing. Other than the ending, however, it’s a excellent film.